I got this great idea from a fellow hockey mom. She has 3 boys and her strategy for staying on top of laundry is simple and yet brilliant. She designates a day of the week for each of her boys and does their laundry on that specific day. She said her boys really don’t have anything white and if there is the odd article, she saves it for the one load of whites she does each week. Otherwise, she throws all of their laundry in the washer in one load. 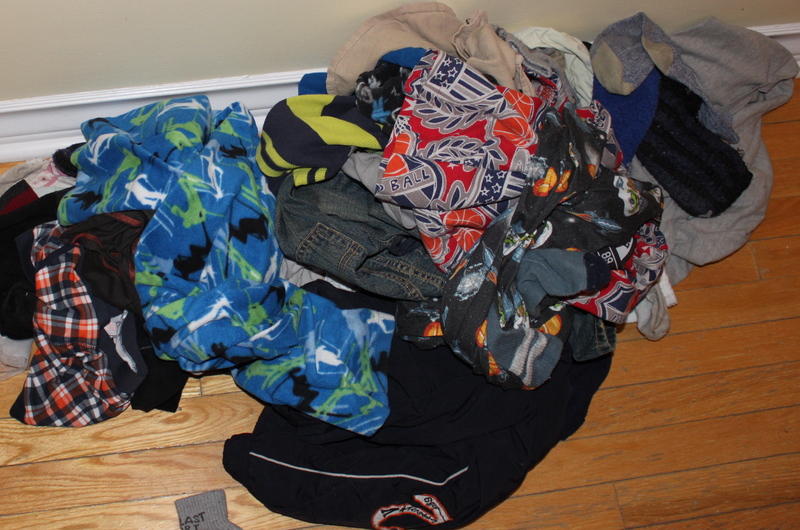 No sorting of colors or separating one kid’s clothes from the other. Everything goes in all at once. Wash. Dry. Fold. Put away. Done. Having a daughter, I know that you would probably have at least two loads with all those pinks and a variety of other pastel colours, but still a great idea. Typically, we have done all of the laundry on the weekends and this was often up to 8 loads. It seemed like the whole weekend was spent doing laundry. What drove me the most crazy was that Eden would “try-on” a medley of outfits during the week, trying to decide on the perfect look for any given day and then toss all the rejects into her laundry basket without having ever worn them. This was an on-going battle at our house and so we came to an agreement ~ I wouldn’t hassle her about her laundry, if she took over the task of doing it. So, she now does her own laundry and it dropped from about 8 loads a week to 4 (for me to do). It is amazing how much less laundry there is without her entire wardrobe in the mix! Doing Shay’s separately, makes this job even easier. I would never normally do laundry on a work day, but one load is super manageable and prevents that big pile up at the end of the week. Although Shay is only 9, I can see how this can easily progress into him washing and drying his own clothes. He already puts his basket of clean clothes away, but has not yet been washer/dryer trained. However, if the task is as easy as removing the few pairs of white socks from the pile and then tossing everything else into the washer, I know he could easily manage that. I guess that will be next on the “training” list. Posted on January 13, 2014 by Cindy Roy •	This entry was posted in Organization and tagged doing chores, household chairs, laundry, managing laundry, staying on top of house chores. Bookmark the permalink.